In the aftermath of the earthquake which struck South Asia barely two weeks ago, the picture in the North-West of Pakistan is worse than has been reported. 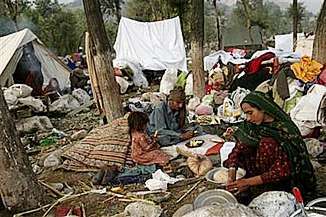 For instance, in Balakot, according to estimates, at least half the city's population of 100,000 are now dead. As commentator Tariq Ali says, "At times like this the entire country feels the need, but it will soon be forgotten, till the next disaster. In a privatized world, the state is not encouraged to buck the system. Things are bad here this week, but they will get worse when rescue teams arrive in areas still out of reach." The scale of the disaster has traumatized the entire country or perhaps not quite. Here in Lahore a group of people collecting funds for earthquake relief were apprehended and charged. They were amassing money for themselves. Even in the midst of disaster, life goes on. Like a giant vulture flock, the global media has descended on the country. The same images repeated every few minutes over three days. The same banal comments. Soon they will get tired and move on. When they are really needed, to monitor relief efforts and reconstruction, to maintain a watch on the funds and alert viewers to the inevitable corruption (in the past blankets and tinned food designed for victims of the floods earlier this year were being openly sold in the black-market) they will not be there. The South is only worth a disaster. Emote and disappear. And, as the media circus moves on, the citizens of the West--they with the short memory spans--also forget. Pakistan will never forget this horror. The picture in the North-West of the country is worse than has been reported. The Prime Minister, Shaukat Aziz, a World Bank favourite, lost his cool at local journalists for reporting the destruction of schools and the deaths of hundreds of children. "Why are you being sensationalist? Be optimistic!" The defensiveness was unnecessary. Nobody blames the regime for the earthquake and even the normally loquacious Frontier province and Afghan mullahs, eager to pronounce Katrina as God's punishment for US wars, have fallen silent. Why would Allah punish the Islamist strongholds in Pakistan? The death toll has been underestimated. Balakot, a small city which is the gateway to the beautiful Kaghan valley and heavily dependent on seasonal tourism, has been destroyed. Corpses litter the streets. According to today's estimates, at least half of the city's population of 100,000 is now dead. A whole generation has been wiped out. Survivors were, till yesterday, without food or water because the roads had been wrecked and helicopters were in short supply. It is the same story in Muzaffarabad, in Pakistani-controlled Kashmir. Everything is wrecked. Here there have been anti-Government manifestations and citizens have looted shops in search of food, just like in New Orleans. Further up on the Indo-Pak border where a state of permanent tension is deliberately kept alive by both sides, there was another tragedy. Four hundred Pakistani soldiers, sitting in their trenches, were crushed to death as the mountain wall protecting them crashed and buried them alive. What of the relief effort? The government is doing its best, but it is not enough. The lack of a proper infrastructure, no serious reserve funds in the budget to deal with unexpected tragedies and a total lack of preparedness despite annual disasters on a lesser scale, has cost innumerable lives. To watch General Musharraf on state television bemoaning the shortage of helicopters was instructive. A few miles to the north of the disaster zone there is a large fleet of helicopters belonging to the Western armies occupying parts of Afghanistan. Why could the US, German and British commanders not dispatch these to save lives? Is the war so fierce that these were needed every single day? Five days after the earthquake, the US released eight helicopters from war duty to help transport food and water to isolated villages. Too little, too late. The Pakistan Army has been put into action, but armies here and elsewhere, are not suited to relief effort. They are not trained to save lives and reports today that aid convoys are being attacked and seized by angry crowds long before they reach their destination is an indication of the chaos. Even in normal times the poor have limited access to doctors and nurses. The state-of-the-art hospitals in the big cities are exclusively for the wealthy. The shortage of medical staff has been a curse for the last fifty years. No regime, military or civilian, has succeeded in creating a proper social infrastructure, a safety net for its less privileged citizens who compose a large majority of the population. At times like this the entire country feels the need, but it will soon be forgotten, till the next disaster. In a privatized world, the state is not encouraged to buck the system. Things are bad here this week, but they will get worse when rescue teams arrive in areas still out of reach.